Long lehenga style kurti affixed with a straight shirt Layered above it. Strings attached on the sides helps in providing nice fitting. 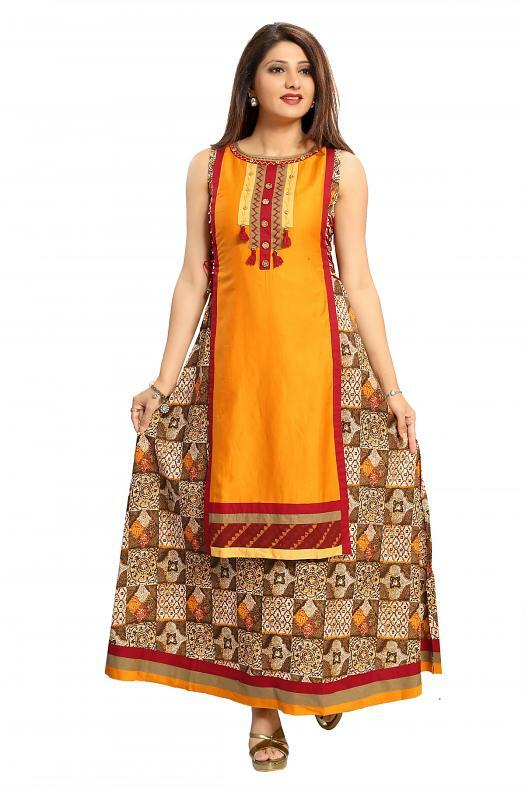 Orange and maroon colored cotton kurti. Shipping Cost $7.99 Buy multiple items online from Asia Boutique & Saree Center to SAVE on shipping. This item in Indian Kurtis & Tunics category was first added to our catalog on 02-05-2019. Buy Long Designer Festive Orange Maroon Sleeveless Kurti , sold & shipped by Asia Boutique & Saree Center where you can shop online for Sarees, Indian & Pakistani Dresses, Imitation Jewelry & Clutches. This Kurtis & Tunics collection has been tagged as Cheap kurti casual kurti semi formal kurti tunics long designer kurti.